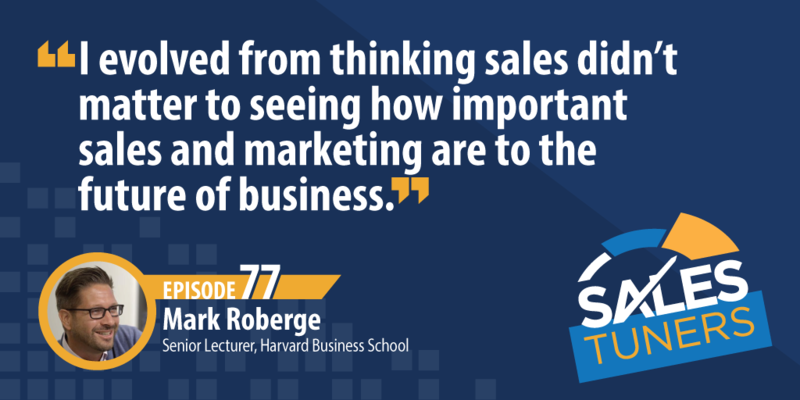 Mark Roberge (@markroberge) was a product engineer from MIT who stumbled into the sales world. Today, he’s a Senior Lecturer at Harvard Business School, where he teaches his students how to sell as well as codify the function of sales impacting not only his students but businesses around the world. Mark started as the third employee at HubSpot as a part-time sales rep. Ultimately taking the company from zero dollars in revenue to more than $100-million and an IPO as Chief Revenue Officer. After repeatedly being asked how he did it, Mark wrote the best-selling book The Sales Acceleration Formula. Successful Customers Trumps Revenue: The goal of sales should not be revenue at all costs. It’s our job to find people we can make successful through the value prop we’re pitching. Rather than focusing solely on the signed contract and commission check, make sure the customers you close are going to find value in what they bought 90 days later. Buyers Don’t Have to Talk to Salespeople: 20 to 30 years ago, every buyer had to talk to a salesperson. Today, buyers can watch demos, compare and research alternative products, and even get ballpark pricing online, all before reaching out to talk to a salesperson. In the shifting world of buyer empowerment, you have to provide value in each interaction with a prospective customer. Live Your Buyer’s Job: What does your prospect’s daily job look like? What’s their role in their company? What are their goals? How do they quantify it? What happens if they don’t achieve it? It’s not enough to just ask those questions. When looking at things through their lens, you can really dig into what they’re thinking before they even look to buy. Specializing in improving top line revenue, Treeline helps you find, recruit, and hire the best salespeople.